One evening in central Washington, Jeff Moore received an urgent call. The man on the line was five hours away, in Canada – a horse trainer on his way to a big race with six horses in tow. He needed Moore’s help, so the two met at a halfway point, a deserted truck stop on the side of a highway. There, Moore cracked open his toolkit, filled with a pulsed electromagnetic blanket, micro-current machines, heat, and ice. Moore is a certified equine bodyworker. He traverses North America to heal injured and sore horses on family farms using qigong, the Chinese medicinal practice of aligning breath and movement for exercise and meditation purposes. Grew up in: The Philippines and California. My father was drafted into the military. Previous jobs: I worked at the Washington Department of Fish & Wildlife, but I didn’t want to work for a state agency. So I bought an outfitting business and took people horseback riding in Hells Canyon between Idaho and Oregon. A client opened my eyes to how chiropracy can help horses move better and make them happier and safer, and I followed that healing path. Job description in two sentences: I do bodywork, training, saddle fits, and clinics to help horses move correctly again. I’m also a qigong instructor, which has really informed what I do with the horses. How large are the horses you work with? Anywhere from 80-pound miniature horses to 1,800-pound warmbloods. But size doesn’t matter much. Ponies and bullfighting horses in Mexico move relatively similarly. Most common problem: Riders. A lot of what happens to horses is because of humans, often because they’re sitting incorrectly or forcing something that shouldn’t be forced. Your toolkit: Mostly my hands and eyes. I’m not much of a gadget person, but I do use a pulsed electromagnetic blanket that helps increases circulation, micro-current machines, heat, and ice. You need to know horses’ movements well enough to be able to see what’s not right. In that sense, horse chiropracy seems similar to human chiropracy. Yes. A physical therapist can know biomechanics from the books, but if he’s also a runner, he has an intuitive sense of what’s happening in a runner’s body. So having the experience of being a rider and a trainer helps me with my work. 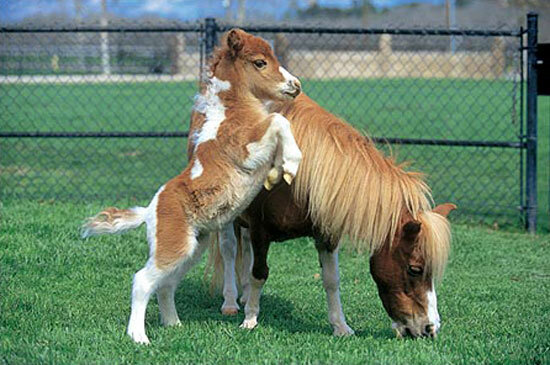 Trained by: An equine chiropractor. Legally, you have to be a vet to do any type of chiropractic or acupuncture work on a horse. I’m not a vet, but I’m certified as a equine massage therapist. Best part of your job: I’m making the world a better place, one horse at a time. I’m helping to bridge the understanding gap between humans and horses. Horses are highly emotional animals. Most challenging part of your job: Horse owners. Usually, when I see that a rider is hurting the horse, it’s not intentional. But my job is to keep out my judgment and help them in any way I can. People own horses for a variety of therapeutic reasons, not simply because they enjoy riding. What would people be surprised to learn about your job? 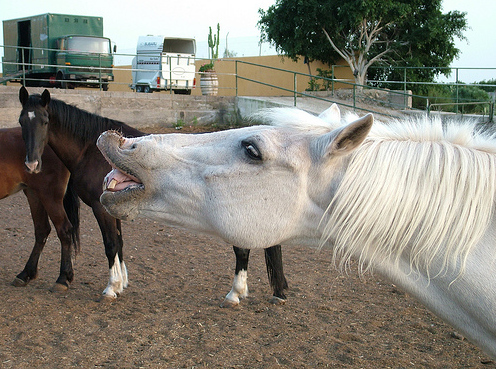 How sensitive horses are. They just want to get along; they’re incredibly forgiving of humans’ mistakes. The more I approach them from a healing point of view, the more I realize that. Other animals you work with: I gave a client’s chicken monthly massages for the same fees that I charge for horses. I’ve also worked on cows, pigs, dogs, and cats. Standard session: About 1.5 hours for $135; clinics for neural re-patterning last for three days. I work with 20 to 25 horses each week on an as-needed basis. I typically don’t get too much information about a horse before arriving at the barn, so when I get there, I ask the owner what’s going on. By listening to the owner, I start a diagnosis in my head. I get my hands on the horse and ask the horse what’s wrong. I watch him move. Sometimes, there’s a big difference between what the owner thinks is going on and what the horse thinks is going on. I decide what tool(s) will best help that horse: body clinics, physical bodywork, fractural relief, or spinal adjustment. I’ve been doing this long enough that it’s often apparent what’s wrong. For chronic musculoskeletal conditions, Moore integrates traditional vet diagnoses with therapeutic horse shoeing, spinal mobilization, acupressure, and flower essences. Do you own any horses? We have a thoroughbred mare, an English cob, and a 19-year-old Arabian horse that my 9-year-old daughter rides and jumps. We also have a few cats and dogs. Meet more hoof-happy No Joe Schmos: the kiddie ride refurbisher and the bull rider. This entry was posted in Cool jobs, Small Business and tagged cute horses, horse photobomb, horse whisperer, qigong exercise, qigong healing, therapy for horses by Megan Hess. Bookmark the permalink.